I love traveling to the western part of the United States, where there’s no shortage of challenging hikes and awe-inspiring views. But let’s be real. Sometimes you need to—or want to—check out some cool sights and unplug a bit closer to home. Fortunately, we have some great options here in the Midwest. In Indiana, one of those areas is…. West! If you saw my photo blog about visiting Indiana’s Turkey Run State Park in the winter, you’ll know it’s a special and unexpected place that offers beauty and adventure year-round. At the end of that blog, I promised to write about visiting this area of the state during the warmer months. So here we are! Gurgling water and lots of green at Turkey Run State Park. If you take a trip to this popular park in the summer and you plan to hike the picturesque Trails 2 and 3, plan for more people and a bit of a slower hike as they make their way under cliffs, through water, and up ladders. Now, I love it when lots of people are enjoying nature. However—I selfishly admit it—I also love enjoying nature when there’s not a lot of people around! Here are some tips on how to explore the beauty of this area if you’re looking for some moments of solitude. I’ve found that regardless of where you’re hiking, starting early helps beat the traffic! 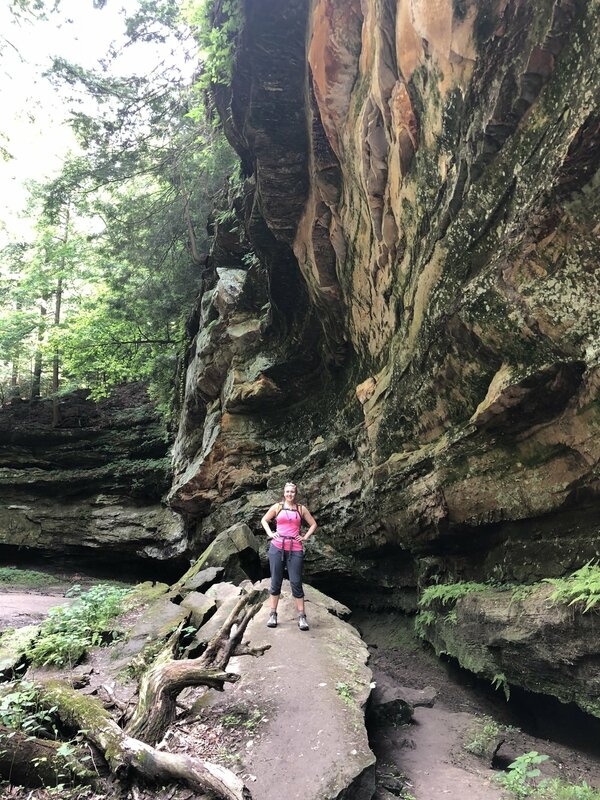 Many trails at Turkey Run are short and interconnected, so you can hit up a popular trail early and then move into the less congested areas as the day goes on. Trail 4, a moderate-to-rugged, 2-mile hike, connects to the Trail 3 and has some noteworthy geology as well as a covered bridge and the historic Lusk Home. Over by Turkey Run Inn, Trail 6 goes through a beautiful, deep canyon and stream. For a little more distance, connect to Trail 7, as each of the two trails is less than a mile long. The meandering Sugar Creek runs through both Turkey Run State Park and nearby Shades State Park. These parks are just a 20-minute drive from each other, so you can easily hit up both in a weekend, or even a day. Shades provides plenty of interesting hikes, with far less crowds. Trails 4 and 5 offer a sloping trek down to Sugar Creek. Rugged return routes, should you choose to take them instead (and you should!) 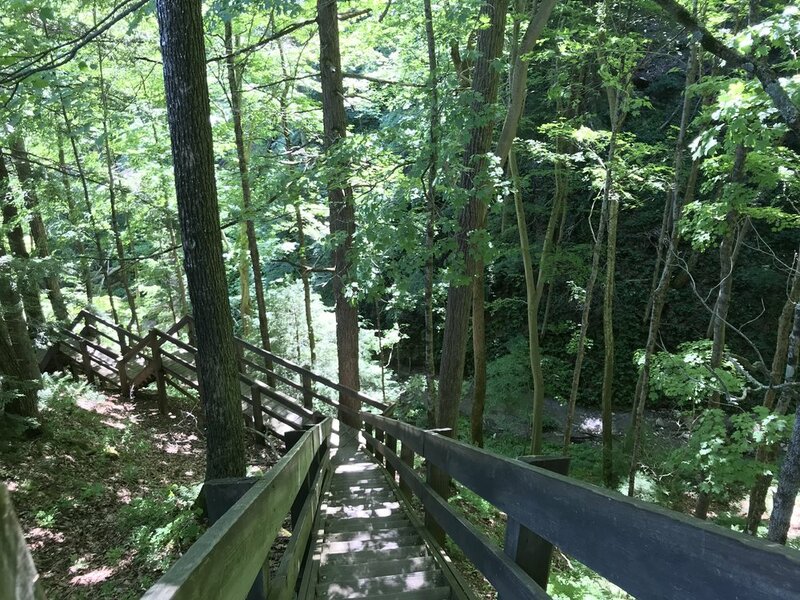 go through the ravines, where you’ll hike along streambeds and use some ladders to get back to the trailhead. What goes down must come back up on Trail 4! The 2.8-mile-long Trail 2 at Shades features plenty of steps (a common feature in both parks) along with a ravine and a small waterfall. On Trail 2 at Shades, you go down the steps, then up a ravine—and yes, up some more steps. If you’re visiting Shades, be sure to stop at the nearby Pine Hills Nature Preserve, the first dedicated nature preserve in Indiana. While it’s technically adjacent to Shades, parking for the access trail is located in the state park. This special spot features old-growth trees, backbone ridges created by gorges from Clifty and Indian creeks, and other unique features. Making our way up to Devil’s Backbone. Devil’s Backbone, reaching 100 feet high and 6 feet wide. Be careful as you maneuver your way to the top, where you’ll see carvings dating back to the mid-1800s. Looking up Honeycomb Rock at Pine Hills Nature Preserve. Below, Clifty and Indian creeks join together. For those who like to be more plugged-in, Turkey Run offers an inn and electric campsites. When spending the weekend in the area, we prefer to camp at Shades, which only offers primitive camping at a drive-up site (beware of the emboldened raccoons) and campgrounds you can canoe or backpack to, adding to the more peaceful vibe. Even though this blog focused on strategies to find some solitude, I truly hope I see you out there on the trail! Questions or thoughts? 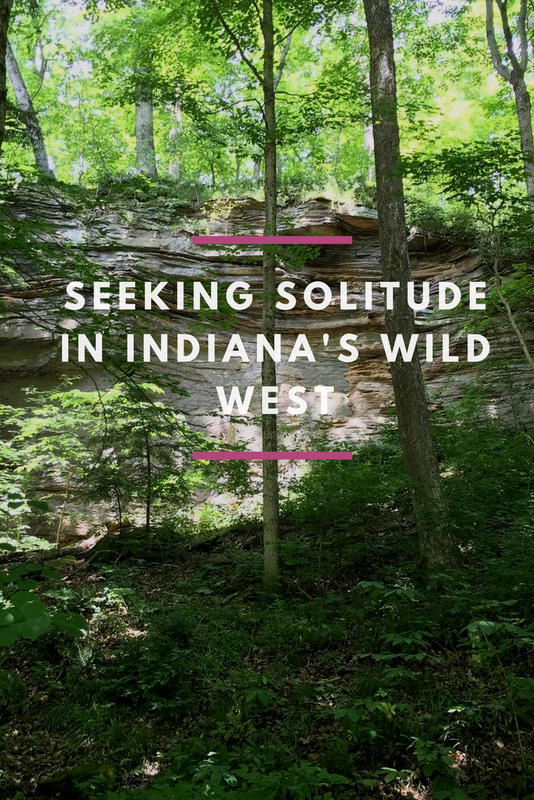 Put your comments below and let's get you set for solitude and adventure in Indiana! Don't forget to sign up in the footer for our email list. You'll get all the latest info on our upcoming events, blogs, and contests in one nice place!